Erin Prais-Hintz invited me to be her partner for her July Pretty Palettes challenge on the Halcraft Inspiration Blog. July’s inspirational theme is aurora borealis. As her partner, I received all these amazing beads from Halcraft. It would be hard not to be inspired by all this metallic sheen and sparkle. These are perfect beads for the aurora borealis theme! Here’s a close-up that really shows off the metallic sheen. If you look above the pendant in both of these pictures, you’ll see two round, blue-gray glass beads. There was a whole strand of those in the package from Erin, but in my rush to design with them, I forgot to take a photograph of all the beads before I started. For my first piece, I made a fringe necklace. Now you see where all those blue-gray beads went! It’s a little hard to see in a photograph, but the blue-gray beads have a kind of inner gleam that reminds me of labradorite. I paired them with matte, metallic dagger beads, silver lined blue seed beads and Swarovski crystals. The multiple colors of the dagger beads brings to mind the many colors that fill the sky during an aurora borealis. You can find the Shine On Necklace on my website. While I was learning a bit more about aurora borealis, I discovered that at times it can take the form of a spiral, as in the picture below. Isn’t that just amazing? 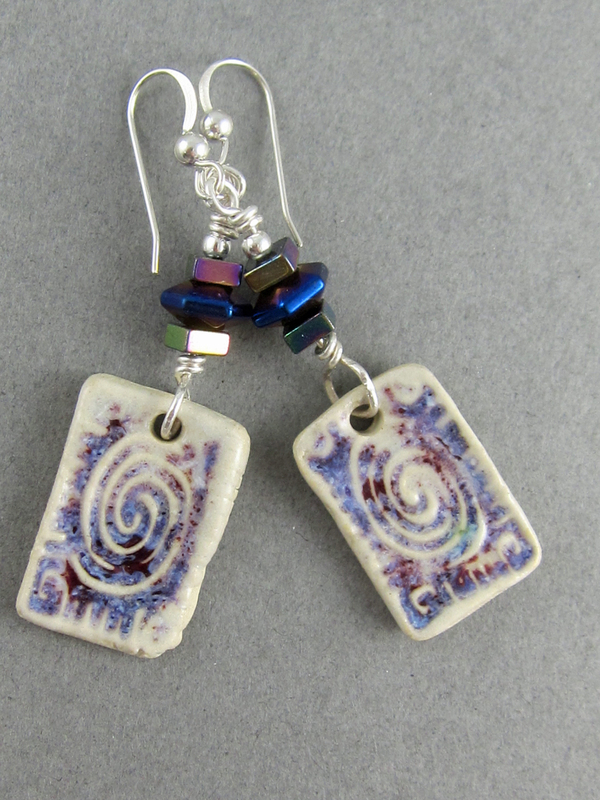 For these earrings, I wanted to express that spiral in the sky. I used a pair of spiral ceramic charms that I made and combined them with a few of each type of the metallic Halcraft beads. 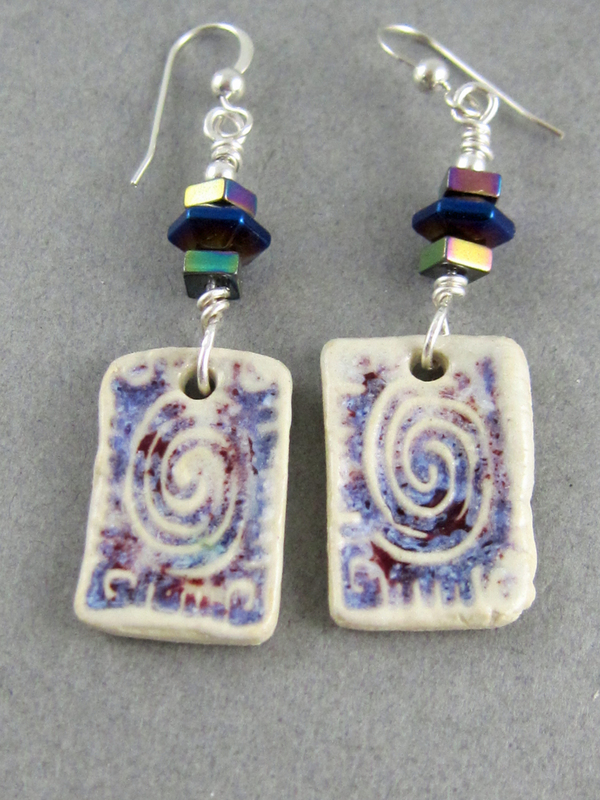 I used a glaze on the ceramic components that breaks into several shades of a black cherry color. I love how that mimics that naturally occurring ombre shades of the aurora borealis. The Aurora Borealis Earrings are available on my website. 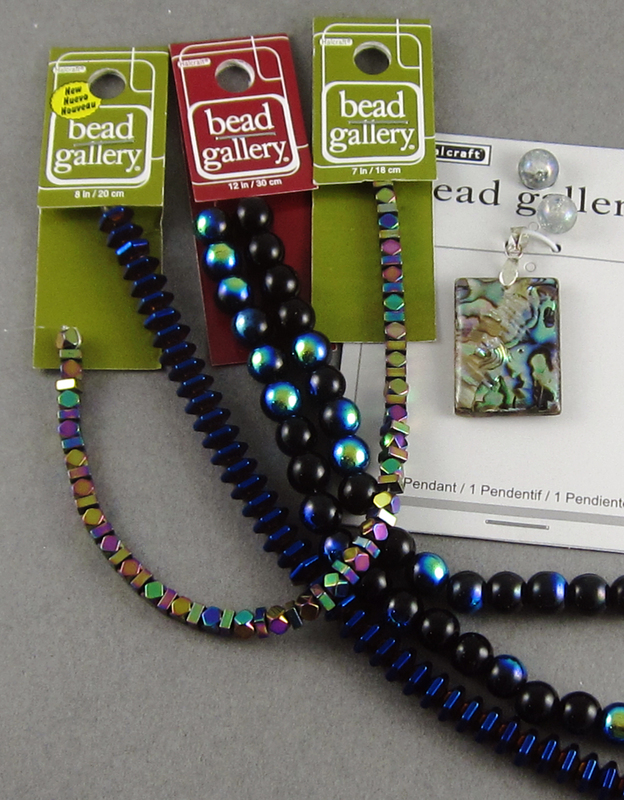 I have more ideas for these beads swirling around in my head, but I’ve run out of time. I would like to thank Erin and Halcraft for inviting me to play along. It was lots of fun. Now I recommend that you hop on over to the Halcraft blog to see what Erin made with these beads and to get links to the other participants. Happy blog hopping! This entry was posted in Bead And Jewelry Challenges, Jewelry and tagged aurora boreali, Bead Challenge, ceramic beads, Erin Prais-Hintz, Halcraft Beads, Linda Landig Jewelry, metallic beads, Micheals, Pretty Palettes by Linda Landig. Bookmark the permalink. I love your playful approach to your designs! Your handmade charms are so pretty and a great match to the theme. 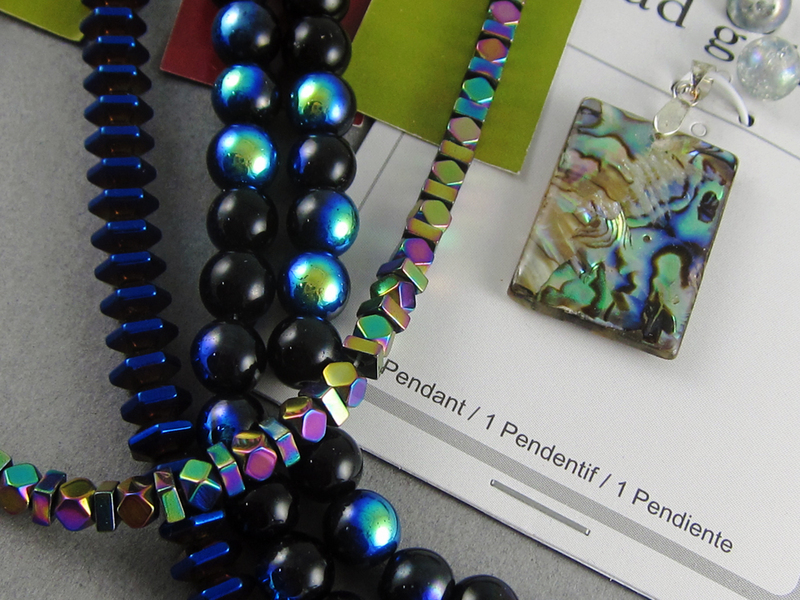 I love the metallic and Aurora Borealis look on beads. I in fact just bought some at Michaels that are similar to some of these. I’m an earring nut so of course they are my favorite, I love the random colors in your clay pieces, perfect to pair with AB. The necklace is cool too!! Spectacular designs! I love that you researched and found more photos for your inspiration. I love the fringe idea with the dagger beads, I’m going to try that myself! Gorgeous !